Rating: 84 percent based on 855 votes. 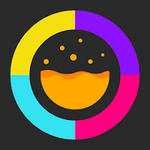 Description: Color Element is an addicting arcade game where you need to try and navigate the ball through various obstacles while collecting all of the stars. See how far you can travel before you hit an obstacle.